WaveTrack’s New Currencies and Interest Rates Elliott Wave Video has been released! We’re pleased to announce the publication of WaveTrack’s mid-year 2018 video updates of medium-term ELLIOTT WAVE price-forecasts. Today’s release is PART III, CURRENCIES & INTEREST RATES – Parts I & II were released during the last month – please contact us for information. •	PART I – STOCK INDICES – out now! •	PART II – COMMODITIES – out now! •	PART III – CURRENCIES & INTEREST RATES – out now! The Annual 2018 CURRENCIES & INTEREST RATES report commented ‘…Despite consensus opinion that the dollar will continue to trend lower during the coming year, the completion of a five wave impulse decline will in contrast, open the way for a multi-month corrective bounce to unfold. Analysis projects a fib. 50% retracement towards 95.42+/- over the next several months…’. The problem with contrarian forecasts is that it’s so binary – either right or wrong which in terms of probability, is insufficient in itself because it comes wrapped in human pre-conception. But when applied with the predictive laws inherent in the Elliott Wave Principle, it becomes a powerful ally. The US$ dollar index ended that five wave impulse downtrend into February’s low of 88.26 – it has since traded higher to 95.52! The same theme of a US$ dollar directional change was also translated across all the other major dollar pairs. But when it came to dealing with a strengthening US$ dollar through 2018, trouble was brewing for Emerging Market/Commodity related currencies. Last January’s report noted ‘…Emerging Market currencies, particularly those traded within the Asian ADXY index are trending higher from the Dec.’16 lows but again, will undergo a weakening period lasting several months before the medium-term uptrend resumes…’. How did these Elliott Wave price-forecasts pan out? As we already know, the benchmark US$ dollar index ended its five wave impulse decline into last February’s low at 88.26 and yes, it has subsequently traded up to targets of 95.42+/- with amazing accuracy. The Euro/US$ was forecast ending its equivalent five wave upswing from last year’s low, then staging a counter-trend decline – the Euro/US$ has since traded down from 1.2556 to 1.1509, a decline of -8.3% per cent. Naturally, if such large currency movements are forecast correctly, then there’s a pretty good chance of anticipating the right direction and amplitude for many other US$ dollar pairs and crosses. But one of the stand-out forecasts for 2018 was the realisation that a strengthening US$ dollar would cause severe declines for the Emerging Market and Commodity-based currencies. Currencies like the Brazilian Real have seen the weakest response to a strengthening US$ dollar, partly because of political upheaval but because of a commodity price meltdown. In Asia, the ADXY Asian Dollar index was forecast last January to begin a sharp counter-trend decline from the 112.20 level – this was expected because the US$ dollar index was due to begin an upside recovery. And sure enough, the index has since declined by -5.4% per cent but is now levelling off. China’s Renminbi was forecast to end a corrective decline towards 6.1050+/- then resume its larger uptrend. We couldn’t know why such a large upswing for the US$/CNY would unfold basis fundamentals but it later became obvious when the exchange rate ended at 6.2432 then flipped up to 6.6800 early-July as President Trump’s trade war entered the retaliation phase with China. There were many more forecasts from January’s report that hinged upon a return to US$ dollar strength, but these are just a few examples – many others followed the same theme. 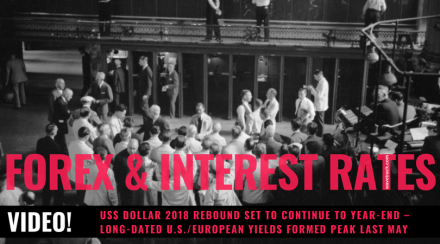 The Annual 2018 CURRENCIES & INTEREST RATES report commented ‘…The July ’16 troughs in U.S. and European yields represent the beginning of the next 30-35-year uptrend cycle. The recent break for the US10yr treasury yield above the 2017…indicates further upside potential into the end of Q1 ’18, beginning of Q2 targeting 3.360+/-…Once completed, a multi-month corrective decline would then begin, pulling yields sharply lower…The US10yr TIPS Breakeven Inflation Rate Spread indicates an interim peak forming at the same time as treasury yields…This suggests worries over the reemergence of inflationary pressures will abate for a while…In Europe, the European Central Banks relaxed approach to inflation means it remains with its existing QE programme…’. US10yr treasury yields began the year at 2.461% with upside targets towards 3.360+/- to complete the five wave uptrend that began from the July ’16 low of 1.316%. The actual peak came up slightly short though, ending at 3.127% into May’s high – it then declined rapidly to 2.748% later that month. The US10yr TIPS Breakeven Inflation Rate Spread began the year trading at 2.075% with upside targets of 2.177%. It traded up to 2.182% last April and has since edged lower at 2.097% to begin a multi-month correction. In Europe, the benchmark DE10yr yield has also ended a multi-year five wave uptrend that began from the July ’16 lows into February’s high of 0.806%. It has since declined rapidly as part of a multi-month correction to 0.182. The ECB has continued its easy monetary policies despite pressure from Germany’s Bundesbank to begin a tightening phase. In this latest mid-year PART III 2018 video, the CURRENCIES section has been expanded upon to include several new currency crosses in addition to the major G8 currency pairs. Medium-term cycles are updated along with the very latest COT Aggregated Position Reports for the US$ Dollar, Euro, British Pound/Sterling, Yen, Aussie Dollar, and Canadian Dollar. The video begins by reviewing the 15.6-year and 7.8-year US$ dollar cycles, their current location and trend, how they correspond to the medium-term Elliott Wave counts. The same analysis is conducted for the Euro/US$ before updating price-forecasts and Fibonacci-Price-Ratio targets for the remaining G8 currencies. Analysis then moves through the Euro-crosses, British Pound/Sterling crosses, before reaching the final segment of Asian/Emerging Market Currencies against the US$ dollar. There is also a weekly time-series forecast for Bitcoin! A total of 47 currency charts. The INTEREST RATES section begins with analysis of the long-term cycle with data on the 30yr yield dating back to the year 1760’s (250+ years!). An overlay of the US30yr yield is added with Elliott Wave counts illustrating the previous Inflation-Peak cycle and the following Deflationary era ending in 2016. EW analysis continues with the US10yr, US05yr and US02yr yields, comparison studies revealing the next major yield trends. The U.S. 10-year INFLATION TIPS is updated which is really important because of the recent rise in inflationary pressures. Moving on to Europe, we examine the impact of the continuing easy-monetary policies of the European Central Bank with the DE10yr yield, its trend and whether it will still be used as a safe-harbour in the event of a new Italian political crisis. In fact, we add the Elliott Wave analysis for the ITY10yr yield before concluding with a look at the long-term Japanese JPY10yr yield with data that begins from the year-1930’s onwards! This new mid-year 2018 CURRENCIES & INTEREST RATES video is like nothing you’ve seen anywhere else in the world – it’s unique to WaveTrack International, how we foresee trends developing through the lens of Elliott Wave Principle (EWP) and how its forecasts correlate with Cycles and other asset classes from around the world. We invite you to take this next part of our financial journey with us – video subscription details are below – just follow the links and we’ll see you soon! Each video runs for at least 1 hour 55 minutes and it’s packed with SPECIFIC Elliott Wave price-forecasts (the Stock Index Video covers 70 charts and is already 1 hour 56 mins. long! And the CURRENCIES + INTEREST RATES VIDEO runs for 2 hours covering 65 charts). BONUS! Each of the 60+ charts illustrated in the VIDEOS will be created into a .pdf document/report and sent to you so that you can always keep these to refer to! PART III will be available in a few weeks’ time (2018!) – we’re working on it! HOW TO PURCHASE THE VIDEO FORECAST? – Please state if you wish to purchase the SINGLE VIDEO for CURRENCIES + INTEREST RATES for USD *48.00? – Or opt for the TRIPLE PACKAGE for USD *96.00 in total?